ATKSideChainCompressor, Software multiband compressor from Matthieu Brucher. Product replaced by the Matthieu Brucher ATKSideChainCompressor 3. The Audiofanzine team is taking some vacations but we’re not closing, for we are offering you a freeware everyday. Let’s start this Summer of Freeware with a stereo sidechain compressor in VST and AU formats for Mac OS X and Windows 32 and 64-bit developed by Matthieu Brucher. The ATKSideChainCompressor can operate in left/right or Mid/Side mode, with the ability to chain the channels. You can use it for parallel or series compression and the Sidechain channels can drive the gain stage. 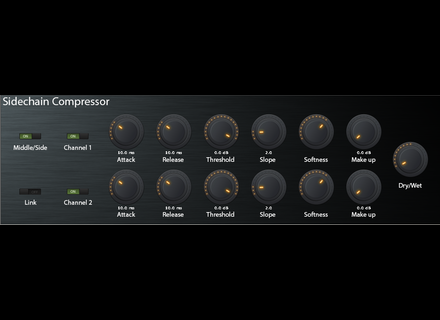 The ATKSideChainCompressor GUI offers controls for attack, release, threshold, slope, softness and a makeup gain for each channel, as well as a global dry/wet knob. The plug-in is waiting for you at matt.eifelle.com. Some users did experiment downloading issues, other links are available in the comments. iZotope lowers the price of Trash 2 iZotope announces a new lower price for its Trash 2 saturation and filter effect plug-in and includes two expansion packs as a bonus. 60% off UVI Retro Organs this weekend This weekend, UVI offers a 60% discount off its retro organ collection for the UVI Workstation. The Mesa/Boogie amps soon in AmpliTube IK Multimedia is now accepting pre-orders for the new AmpliTube series of guitar amp collection, which is fully dedicated to Mesa/Boogie models.